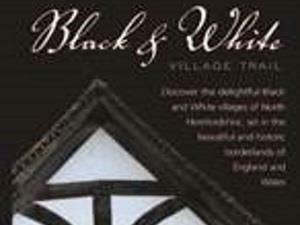 Black & White Village Trail01568 616460work Walking RouteThe Black & White Village Trail – ‘unrivalled in England’. This is how Alec Clifton-Taylor described the half timbered ‘black and white’ buildings of north-west Herefordshire. Come and see if he was right! The Black & White Village Trail is a motor route through some of the prettiest Herefordshire villages and most beautiful landscape in England. The 40 mile circular trail leads west from the ancient town of Leominster, through a rich landscape of orchards, hopyards and distant hills, taking in the most picturesque black and white villages along the way as well as the little market town of Kington. The villages are more than just pretty places to visit. Each one has its own character and community, with tea-rooms, shops, craft workshops and pubs waiting to welcome the visitor. Take advantage of the quieter pace of life and enjoy a day spent following the byways of quintessential rural England. View the Black and White Village Trail on the Attractions page. Want to leave your car behind? Public transport is available to take you between a number of Herefordshire’s Black and White villages and of course you can always take to the country lanes walking and cycling. There are some beautiful places to stay, eat and visit in this part of Herefordshire – make a short break out of it and enjoy all that the area has to offer. Many of the houses to be seen on the Black & White Village Trail are timber-framed – that is, the framework of the house is built from green (unseasoned) oak, and the panels are infilled with lath – woven strips of wood and plaster. Occasionally, panels would be infilled with brick. Panels had limewash applied, often tinted with natural pigments. The idea of decorating timber-framed houses by painting the beams black and the panels white is a surprisingly recent one. Many of the houses date from the 16th and 17th centuries or earlier, when timbers were often left unpainted to weather naturally, while the panels were painted with pigmented limewash – sometimes both beams and panels were limewashed. In the 18th century when stucco and stone finishes became fashionable, many houses had their timbers plastered over. 19th century photographs of Herefordshire show houses which now have exposed beams, but which were then covered in plaster. Throughout the 19th and 20th centuries, many houses were restored and their timbers exposed. The practice of painting the beams black and panels white, in part to emphasise the intricate patterns of the timber frame, became established. Recently fashions have changed again, and now some houses have had paint removed from beams to reveal the natural colour of the weathered wood, while the panels are limewashed in soft earth tones.